I read numerous articles each week to further my own knowledge as a coach and athlete. Most of the information get stored in my head and later referenced. However, every once in a while, I come across articles so worthy of reading that I wish I could share them with everyone I know. The following article is that type of article. The author, Chad Wesley Smith, is the founder and head coach of Juggernaut Training Systems. In addition to his ridiculous raw squat numbers (905lbs in the 308lbs class with a belt and knee wraps), he has coached numerous others to incredible athletic feats. After reading his book and experimenting with his "Juggernaut Method" of strength cycles, I have become quite a fan of his. Simply put: He knows a thing or two about a thing or two. Since we squat frequently, little tips like these may make a drastic difference for your performance. Consider reading the article a few times. The squat, as with all the competitive lifts, requires great strength throughout all the prime movers and great technique. Great squatters have tremendous strength from head to toe; the quads, hamstrings, glutes, hips, abs and entire back must be well developed for success. Total body strength and technique is best developed in concert with each other, so that your technique doesn’t hold back your strength development, nor your strength not being enough to hold proper technical positions. 1- The closer you can put your hands to each other on the bar the easier it will be to have a tight setup. Make sure though that your elbows are inside your hands to maintain tightness. Using a thumbless grip often improves the comfort of a close hand position. 2- Squeeze your elbows towards the middle of your body to improve upper back tightness in the setup. Once you squeeze them toward your body as hard as possible, force them forward, under the bar. There will be very little movement of the elbow forward if you are doing a good job of squeezing them in. 3- Get air into your midsection by focusing on breathing into your low back, this will create 360 degrees of pressure, improving performance and helping your back stay healthy. Get air before you bring the bar out of the rack with your hips. 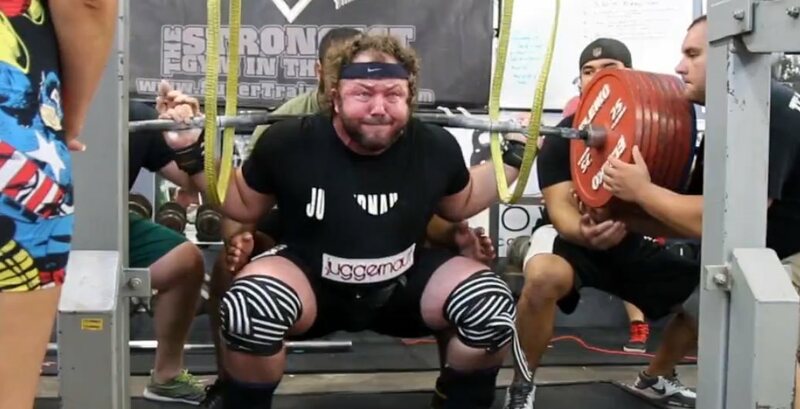 Chad Wesley Smith squatting 855 in a belt and knee sleeves as he prepares for GPA Raw Worlds in Sydney, Australia. 4- The walkout should be achieved in 3 steps maximum and can be achieved in 2. Step back with your off foot, set your dominant foot and then make any repositions of your off foot necessary to find your stance. 5- Once your feet are set, take more air into your midsection by breathing into your low back, while also flexing your glutes hard to neutral your spine and squeezing the bar hard in your hands. 6- Focus on maintaining 3 even points on contact in your feet throughout the lift, weight should be even through the big toe, little toe and heel. Do not focus on excessively sitting back onto your heels if you are a raw lifter, this is not advantageous because you don’t have a suit to sit back into. There will be some forward movement on the knees in the lift and that is fine. A short movement of the hips backwards and then squat down from there. “Back, back, back” isn’t for you, it is more “down, down, down”. 7- Commit to the descent in the lift. Going down as fast as possible is critical to take advantage of the stretch reflex and avoid expending unnecessary energy on the way down. This doesn’t mean you need to dive bomb squat by any means. You need to descend as quickly as YOUR TECHNIQUE can hold up to. There are great squatters like Stan Efferding that descend very slowly because he has balance issues, so that is as fast as he can go down. However fast it is, practice it from an empty bar to your max and keep it consistent. 8- Keeping the knees in line with the toes or slightly outside is valuable to create torque in the hips. “Knees out” though is often not the proper cue to achieve this as it causes the lifter to shift the weight to the outside of their feet and lose 3 points of contact. Instead, try to “screw your feet into the ground” by externally rotating them throughout the lift. 9- The last thing to move during the descent is the lift, so it should be the first thing to move on the way up. Keep your chest up out of the hole by driving your head and shoulder back into the bar. Also drive your elbows forward under the bar (again there may not be much actual movement of the elbows but the intent will help you avoid collapsing forward) as you initiate the drive out of the hole. 10- Focus on accelerating the bar throughout the concentric movement all the way to the top of the lift. The bar doesn’t need to actually jump off your back (ala Eric Lilliebridge) but that intent should be there.